I hope you are having a good week! It is starting to feel like Spring already here, and I am loving that. I hope the cold weather has already gone for the year. Today one of Momma's blogging friends, Kaitlin, has stopped by for a visit. Kaitlin blogs at kedgotwed.com, a lifestyle and newlywed blog. Kaitlin has shared a very cute childhood photo of herself with Duffy, another beloved family dog. Abby: Thanks for stopping by! What pet would you like to remember at my blog today? Kaitlin: Maggie - an adorable, black lab with the biggest heart! She was in my family for about 10 years! Abby: What are some happy memories of your pet? 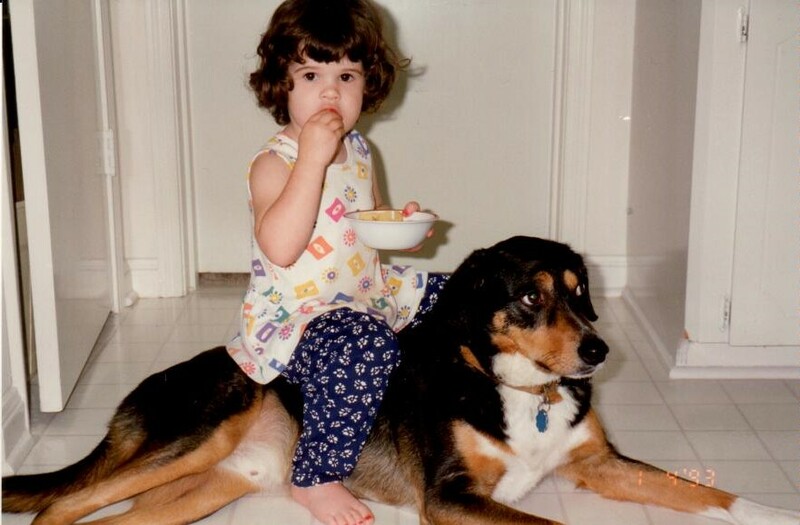 Kaitlin: When we first brought Maggie home, she was a puppy and I was in 4th grade. Her crate was in the laundry room, which was all the way across the house from my bedroom. However, her first few nights with us, I would wake up to her crying in the middle of the night. It absolutely broke my heart to hear her crying! One night, I took my pillow and blanket into the laundry room with her and fell asleep on the floor next to her crate. When my parents woke up, they found Maggie and me fast asleep!! Kaitlin: Maggie was a HUGE goofball!! Every time we let her into the backyard, she would get so excited and run in circles! Sometimes, she would even try to climb the big pine tree (literally)!! Abby: I enjoyed visiting with you today. Is there anything else about Molly you would like to share? Kaitlin: I give Maggie all of the credit for my love of dogs! She taught me that dogs fill a place in your heart that humans can't...and that there's nothing wrong with that! I know that Maggie is up in doggy heaven climbing all of the pine trees! Haha! Abby: Kaitlin, thank you so much for visiting! I loved hearing about Maggie. I can just picture her trying to climb a big pine tree! Thanks for your visit, and have a wonderful weekend! I can totally relate to not being able to stand hearing a puppy cry. I probably would have done the same thing (or snuck the puppy into my room haha). Aw Maggie sounds like the SWEETEST dog!!! I loved hearing Maggie's story. What a wonderful dog friend! I think every child should grow with a dog or other pet. They teach us to be kind, loving people. Thanks for sharing Kristin. 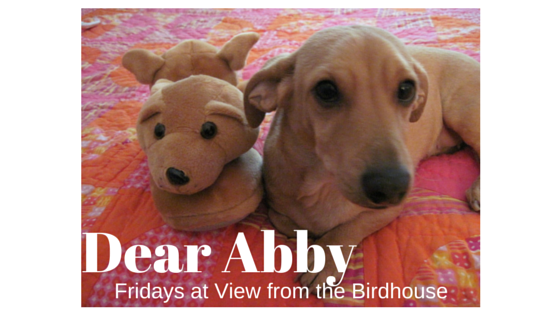 Abby, as usual, you conducted another great interview!! It is so true that dogs fill a place in our hearts that no human can! Great story, I'm thankful that Maggie shared. Haha both of our Westies always tried to climb trees! They were always after squirrels and birds. Maggie sounds like a great dog! I think that people who grow up with dogs are really lucky, myself included. Thank you so much for the visit! I'm so glad you enjoyed reading memories of Maggie too. Kaitlin, thank you again for sharing these memories here! I had so much fun sharing my memories of Maggie with you all!!! I love hearing that Maggie isn't the only dog who liked to climb trees - haha!! Kaitlin, what a wonderful memory! I'd love to know what breed Duffy is, our Kyra looks exactly the same, we got her from an animal shelter and she came from Greece.